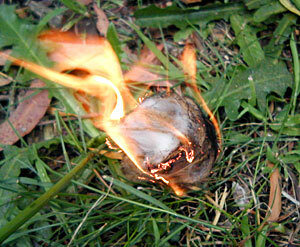 The easiest way to make fire by friction (that is, by "rubbing two sticks together") is the bow drill fire. 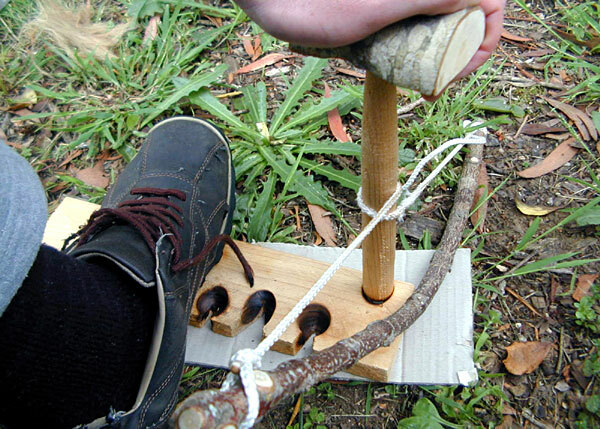 Another method is the hand drill fire, which is harder to learn, but has the advantage of not requiring cordage, and therefore being easier if you had to start completely from scratch using only naturally occuring materials. 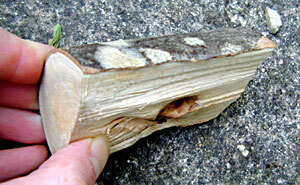 For beginners to friction fire, I would recommend starting with the bow drill fire. 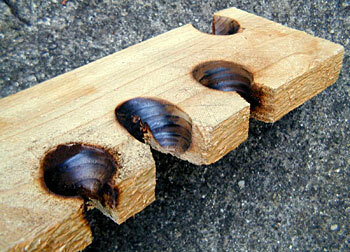 The easiest way of all to get started is to purchase a pre-made bow drill firemaking kit, which is what I did. My kit came from Thomas J. Elpel's website and cost US$28. I learned how to use it from the excellent Fire Volume 1 DVD. The bow drill fire requires four basic parts: The bow, the drill, the fireboard (also called the hearth or base board), and the handpiece. It is also very useful to have a fifth part, some kind of flat board (cardboard or wood work fine) to place under the fireboard to catch the wood dust as it forms into a coal. An overview of the assembled bow drill is shown below. 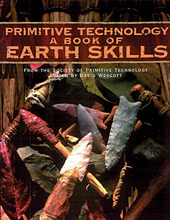 Note that the pointed end of the drill goes upward, with the blunt end at the bottom doing the drilling. You also need a tinder bundle (see below). Bow drill firemaking kit assembled and ready to go. Note the correct body position, as shown in the picture above. There is a proper body position for the bow drill, and you will find it much easier if you adopt it. For a right-handed position, kneel on your right knee, with your left foot supporting the unused end of the fireboard and holding it firmly in position. Your right hand holds the bow and your left hand holds the handpiece at the top of the drill spindle, with your left forearm braced on your left thigh close to your knee. A left-handed position is all that with left and right sides exchanged. 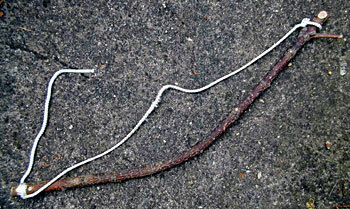 Note also the correct orientation for the bowstring. It is wrapped around the drill spindle so that the drill is on the outside of the string. That is, if you drew a straight line along the bowsting (not including the bit that wraps around the drill itself), the string is between the bow and the drill. This prevents the string from cutting into itself while you are drilling. Also note that the string is wrapped around the drill so that the upper part of the string comes off the bow towards the end you are holding. This makes it easier to control the bow. This is the bow that was shipped with the kit. 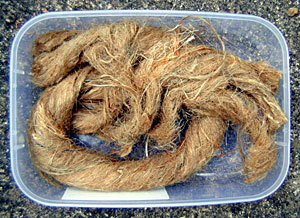 It has had some use, and before long the cord will need replacing. If you want to make your own, construction	of	the	bow	is	not	difficult. 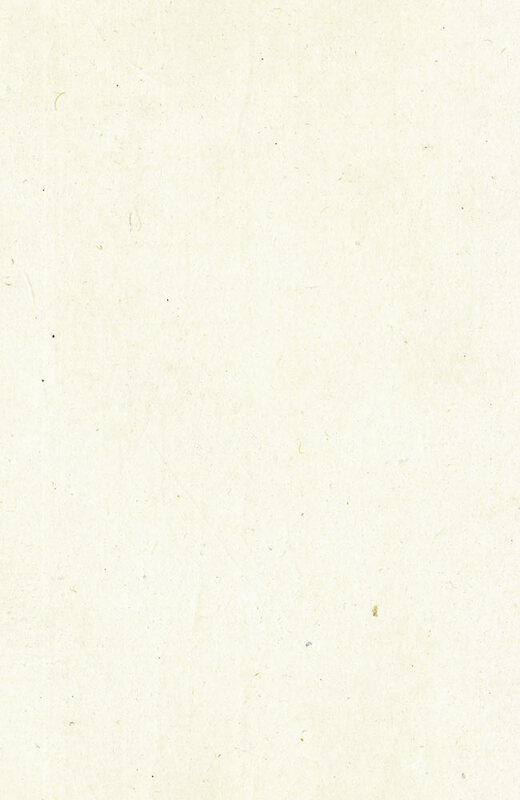 The wood type is	not	important, as long as it has a bit of spring in it. The upper drill is the one shipped with the kit, after use. 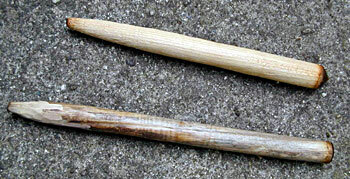 Note that the blunt end (on the right of the photo) is the lower end, that	does	the	drilling. 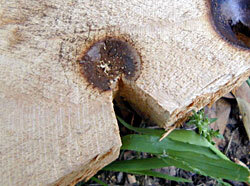 This is a close-up of the fireboard, showing the end with holes where I have made fires. The original fireboard as shipped with the kit had one hole burned in, with the notch already cut. 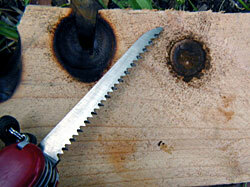 I have been able to get about three fires from each hole before drilling almost all the way through the board. This is the handpiece. It is a good idea to smear some vaseline (or animal fat if in a real survival situation) into the hole and onto the poined end of the drill, to reduce friction. You want plenty of	friction (which is what causes the heat) at the lower end of the	drill,	and	as	little	as	possible	at	the top. I like to see how small I can make the tinder bundles and still get a fire. 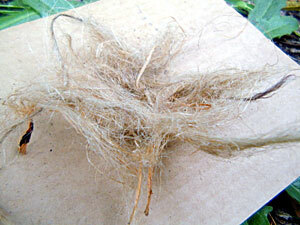 Normally you would make it a lot bigger than this (more like an actual bird's nest). For today's fire I made a new hole in the fireboard, as the old holes are almost worn through. 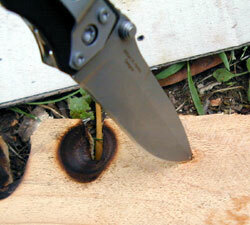 Start with a knife or other sharp object to make a pilot hole. Then you start drilling (with the bow drill set up as if you were trying to make fire),	until	you get	some	smoke	and	the	hole	is	a bit	charred. You	are not	trying	to get	fire	at this	stage,	just	to burn in	the hole. The hole after it has been burned in (on the right of the picture). The Swiss Army Knife saw as used to cut the notch is also shown. Cut the notch almost to the centre of the hole. After the notch is cut, you are ready to	go. I had some wood powder left over from a previous attempt (where the hole was too old, almost going right throught he board, so I had to stop). I put that in the notch because the coal forms faster if there is already some powder there. 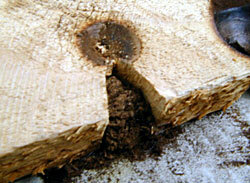 The proper term for the wood powder is "punk". Now it is time to start drilling. You begin slowly, perhaps one second per complete stroke back and forth with the bow. Press down with the handpiece, but not too hard at first. 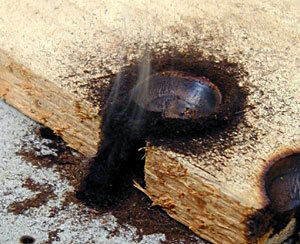 As you drill, wood dust (punk) will fall into the notch, and you will start to see smoke. You need to heat it all up to something like 800 degrees before it will ignite, so take your time here. I like to count as it all seems to happen faster when I count. After counting to about 30, maybe 50, there should be a fair bit of smoke. At this point, go really hard and fast for a bit longer, maybe another 20 or 30 counts, although you may need more. When there has been a lot of smoke, for a while, stop drilling and take the drill away. Blow gently on the pile of wood dust. If it keeps smoking after you have stopped drilling, you have a coal! If it goes out, you need to keep drilling. It is easier in hot, dry weather than in cold, damp weather. Once you get a coal, there is no hurry, it will smoulder away for quite a while before it goes out, so you can take your time. (When I was taking this photo series the camera batteries ran out just as I got the coal. I had time to go back into the house and change the batteries before placing the coal into the tinder bundle). 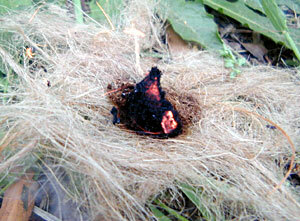 Here is the smouldering ember, or "coal", which has formed from wood	powder and got hot enough to stay lit. Blow gently on the coal to make it spread, then let it rest for a few-several seconds. Do that a few times until the coal has spread almost right through the	pile	of	dust. 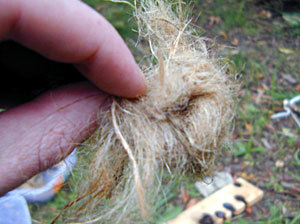 Then	you	carefully lift the fireboard	away,	and	transfer	the	coal	(a small stick is helpful)	into	the	tinder	bundle. Here you can see the glowing coal in the tinder bundle. I was gently blowing on the coal to make it glow more as I took the photo.